You'll notice that this meme has no words. But, really, when one thinks of Sarah Huckabee Sanders, well... hell, there are no words! 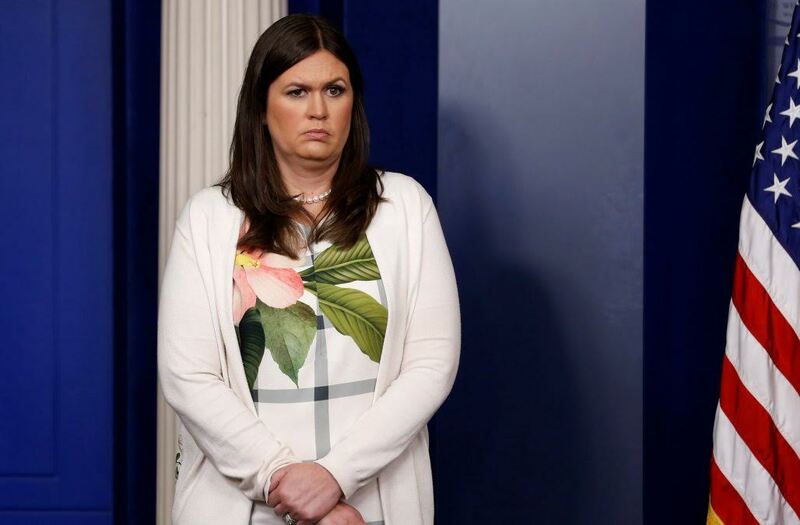 A picture of Sarah Huckabee Sanders really is worth more than the far, far less than 1000 words in her limited vocabulary. In Sarah's case, she uses what words she has to, not form lies, but parrot lies; the lies of her boss. I've seen absolutely no sign of independent, critical thinking ability in Sarah. She is definitely a parrot. She might as well be standing on one of those wooden pedestals that parrots, parrots who are born parrots like. I have a friend who has a parrot named Roxanne. When she's not walking around the house or sitting on my friend's shoulder, she has a gigantic seven foot high cage. Sarah Huckabee Sanders kinda has the same deal. Roxanne has more self esteem and more words though. Lots of people make cutting remarks about Sarah's looks. I don't think that's right because I think that what people are really reacting to when they look at Sarah is the ugliness of the inner person. Sarah's inner person is so disturbing and so fetid that it comes roaring to the surface. I really believe that, if Sarah was a nice person and had a warm, outgoing, pleasing personality, the story would be significantly different. People also say that Sarah's eyes are not only windows to an ugly, sick soul, but are the eyes commonly seen in areas of the world where inbreeding is prevalent. That may be, but, if she is the result of inbreeding, let's be fair. That is not her fault. We must remember that her father is staunchly anti-abortion and believes that a fetus should come to full term no matter what. People like her father (she definitely has her father's eyes) also believe that any child, no matter what the circumstances of conception are, can lead a constructive, positive life. Unfortunately, that's not what has happened with Sarah. She chose the opposite path. It shows through. So, there you have it. I've said what I have to say about Sarah Huckabee Sanders for today. I have just one additional thought: Why is she wearing a 1950's era tablecloth as a dress? Sarah Huckabee Sanders' appearance is only relevant in so far as they do not enable the legacy Fox News jobs handed to other, prettier right wing spawn like Megan McCain and Abby Huntsman. She has the heart and soul of a right wing Fox but not the physical attributes.